An excellent quality fully-built quiet gaming PC, using best value high performance components installed in a tiny Micro-ATX case. This machine have a choice of Intel's B360 or Z390 chipset and comes with a two-year fully inclusive warranty. 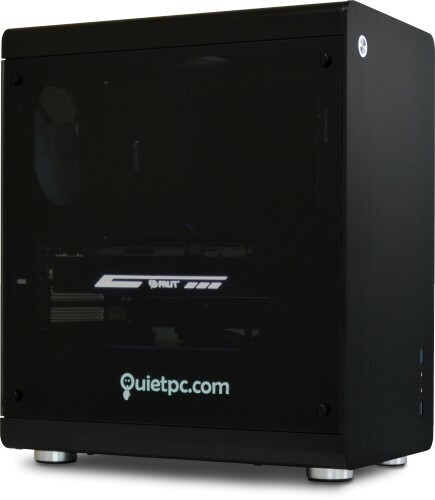 The Serenity Mini Gamer is based around Jonsbo's excellent RM3 aluminium chassis, which is an ideal case for customers looking to build a high end gaming system in a small elegant package. From tempered glass side panels to a sleek fully brush aluminium exterior, the RM3 most definitely looks the part! This PC takes advantage of Intel's latest Coffee Lake CPUs. These processors have broken the mold as they now feature more cores and threads compared to previous generations. The Core i3 now features four cores and the i5 and i7 versions are now 6 core CPUs, which is an increase of two cores for each processor. As well as an increase in core count, the amount of threads for each CPU has also gone up, meaning more multi-tasking can be achieved. These additional cores and threads really make the 8th and 9th Generation a great performer. For example, the Core i3 8350K CPU is now equivalent in terms of performance to the 7th Gen Core i5 7600K but costs significantly less - giving you more performance for less money. You'd think there would be a downside to all this extra performance but to be honest we cannot think of any. The CPUs have a maximum Thermal Design Power (TDP) of 95W for the K-suffix and 65W or 35W for the others, meaning they can take advantage of the NoFan fanless CPU coolers and be cooled without the need for a fan! Now that is fantastic (pun intended). 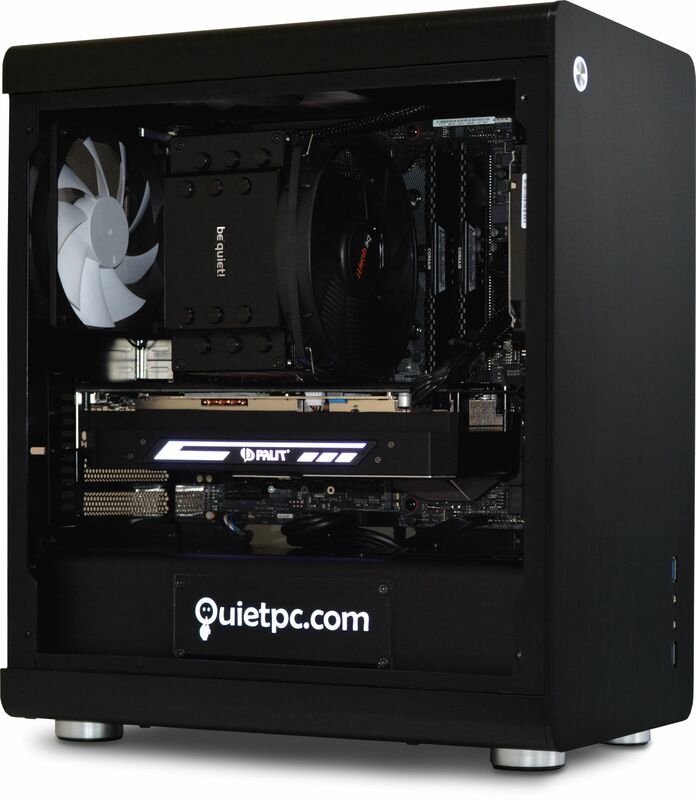 We've done a lot of development work in this area to bring you the Serenity Mini Gamer - a fully built high performance PC which we think offers the best of both worlds - virtually silent running (especially when the PC isn't being used for gaming), and extraordinary gaming performance with great cooling design which gives total safety and reliability for your precious CPU and GPU. By default we offer the excellent ASUS B360M-A motherboard with this system, which is ideal for good gaming performance. For customers looking for even more features we also offer the ASUS TUF Z390M-Pro Gaming motherboard. The Z390M features everything the B360M-A does along with additional features such as support for 9th gen CPUs, Wi-Fi/Bluetooth built-in, extra USB3.1 ports and better onboard audio and LAN controller, just to mention a few. PLEASE NOTE: The B360 motherboard support only the Intel 8th Gen CPUs. If you require a 9th Gen CPU please choose the Z390 motherboard. Jonsbo RM3 Zone RGB Silver Window Micro-ATX Aluminium Case ? Nanoxia 30cm Rigid RGB LED Lighting Strip (B360 Motherboard only) ? ASUS PRIME B360M-A Micro-ATX LGA1151 Motherboard (8th gen CPU only) ? ASUS TUF Z390M-PRO GAMING (WI-FI) LGA1151 Micro-ATX Motherboard ? FSP Hydro G 850W Semi-Fanless Modular PSU, 80+ Gold ? I bought the predecessor model to this 4 years ago and apart from being shipped with a noisy power supply, which I had to replace, it has operated perfectly, and almost silently ever since. The system did not get perceivably noisier as time went on nor did any other component fail. So I felt confident buying this model again. The new model is much smaller and the case has glass sides. 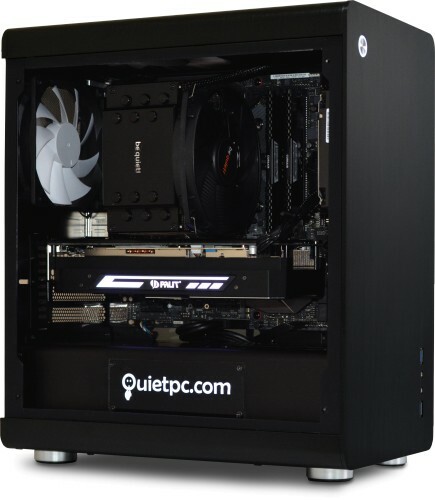 This looks prettier but it does come with two large, permanently on case fans and is therefore slightly noisier when idle than the previous model. Not much though and under heavy load they are equally quiet which for me is where it matters. The metal top of the case does get very hot under load. I went for high spec processor and GPU options for gaming and have not had any noise, performance or overheating problems. (Tested at the height of the UK heatwave!) I would definitely recommend this product for serene gaming.